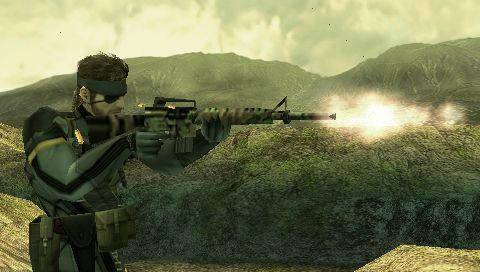 Solid Snake shoots his way onto the PlayStation Portable in the latest addition to the Metal Gear Solid franchise that returns to the original gameplay of the PS2 and PSOne rather than the turn based trading card games on the PSP called Metal Gear Acid. As the title is back to original incarnation, the gamer must use stealth, combat and strategy to successfully complete the missions. The title is also a combination of action, adventure and strategy that create an addictive title that fits perfectly with the current MGS mythology. Refining the gameplay of the online multiplayer mode from Metal Gear Solid 3: Subsistence, Metal Gear Solid: Portable Ops lets players engage in online skirmishes through the PSP system's wireless infrastructure functionality. Players will be able to use their squadron from the single-player portion of the game as well as recruiting new members and trading with other players, unleashing their distinctive abilities and wreaking havoc across the game's numerous multiplayer levels. Metal Gear Solid: Portable Ops also introduces a new "White Flag" system to the game's multiplayer modes, letting players choose to surrender and live to fight again in each round or fight to the death until the next game begins. Placing emphasis on stealth gameplay, the White Flag System further evolves online play for the Metal Gear series and creates a bond between the player and their team as they work together to achieve their objectives. The story of Metal Gear Solid Portable Ops is set in the 70’s and transforms gamers into Naked Snake, the hero of MGS3 who has been taken captive a South American militia. Fortunately our hero manages to escape and is intertwined in a world of espionage, double-crosses and an extremely in-depth tale that only Kojima could have pulled it off. The average gamer should successfully complete this title in around 15 hours and for those that have played the previous title on the PlayStation 2 will be pleased to know that Snake still has the same moves which have been successfully implemented on the PSP control system. The only downside of the title is the camera angle which although not fixed, the player still has the ability to reset the camera angle by pushing the left shoulder button. The missions have also been slightly scaled down and make most of the goals quite reachable which is perfect for the handheld market. 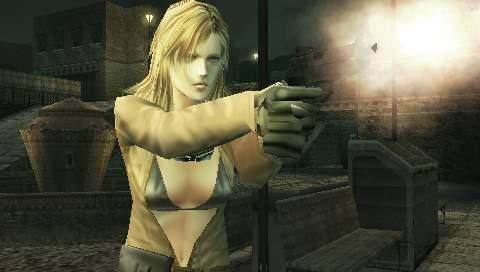 The game also supports a variety of new features to the MGS mythology that allows you to recruit new soldiers for your unit by scanning the area around you for wireless networks, the game generates new soldiers based on the networks the PSP can see around it, and it's possible to find some extremely powerful allies in this way, although of course, it's not actually required that you do this to complete the game. When you take Portable Ops online, the battles work out in broadly the same way as they did in MGS3: Subsistence for the most part there's also a single-UMD multiplayer option for local wireless play, which is a nice addition, although it's somewhat less fully featured than the proper multiplayer modes but there's the option to fight a squad-based battle against someone. Soldiers that die, stay dead and your rival has the ability to nab them and add them to his own collection. Of course, you can do the same to his goons, too. Graphically, Portable Ops certainly pushes the PSP; it doesn't look as good as its big brothers on the PS2, and blood effects have been removed for some reason but it's still a visual treat. The character models, in particular, are very detailed and well animated; the environments, however, can be a little disappointing, since they tend to involve a lot of concrete and crates. Beautifully rendered concrete and crates, mind. The audio, too, is worthy of praise, the music echoes Harry Gregson-Williams' score very well and the voice acting is very slick and professional, with David Hayter reprising his role as Snake and a number of other talented actors lending their tones to a cast of extremely well realised villains. In conclusion, MGS Portal Ops is a damn fine game that features state-of-the-art gameplay for the PSP and is a definite must to lovers of this genre or series. Great graphics and the lot!